This hairy dragon smells like a wet dog. Name that Dragon! Yesterday's winner was the very first entry, "Gorgey (the Dragon)" from commenter Nathan. Now I'm not 100% sure of how to pronounce "Gorgey," wether it is "Gor--jee" or "Gor--ghee." The judges were very happy with both. Congratulations! This is a Friday dragon, so you have all weekend to figure out just the right name for it! Have a good weekend. Had to use this. We call my dog this and he liiks exactly like this expect minus the wings. We call my dog mophead because when he drinks water dribbles off of his chin and goes everywhere. sorry my comment is supposed to say or oopa not oroopa. but oroopa is still a cool name. Pelhedor lived in the dark, crystal-filled cave were other members of his species lived. The only problem was his intense stench. He smelled worse than a wet dog on a garlic farm. He tried going to school, but he was excluded from activities by his peers. Coming home from his classes was no better. His parents bathed him and washed him forcefully to not avail. The smell of poor Pelhedor was so too reeking for even the toughest dragons (like Rhinotar) to withstand. Eventually, the depressed Pelhedor could take abuse no more. He fled from the cave and flew off into the woods of darkness. There, he found a new cave. But it was a gloomy cave, one that would not make a young dragon happy. Here, Pelhedor made an adequate home. It is said to this day that Pelhedor can still be heard hunting dear and other game in the woods. One must hold their breath when walking through the woods, or the dragon's stench would cause permanent inability to smell. "Fleagle: The One And Only Home for Fleas"
Fleagle always felt sorry for fleas. They were always being killed whenever they found a new home. To stop this, he allowed fleas to eternally have a home in his fur. The fleas are grateful and in turn help him spot food when he flies. However the fleas' eyesight is not that great so they don't help much, but Fleagle appreciates it. The two posts before this both have "Fleagle" on them. To clear up any uncertainty they are both by me. I thought of some good names: Dwalin, Balin, Kili, Fili, Dori, Nori, Ori, Owin, Glowin, Biffer, Boffer, Bombour, or Thorin Oakenshield. I am NOT stealing from The Hobbit! Hey, who said I couldn't enter? I think I should be allowed to enter a name from time to time. Though not among the very oldest, Stakkunalt is one of the wisest of the dragons. Many have come to him for counsel through the ages, and nearly every member of the Grand Council was at one time taught by him. 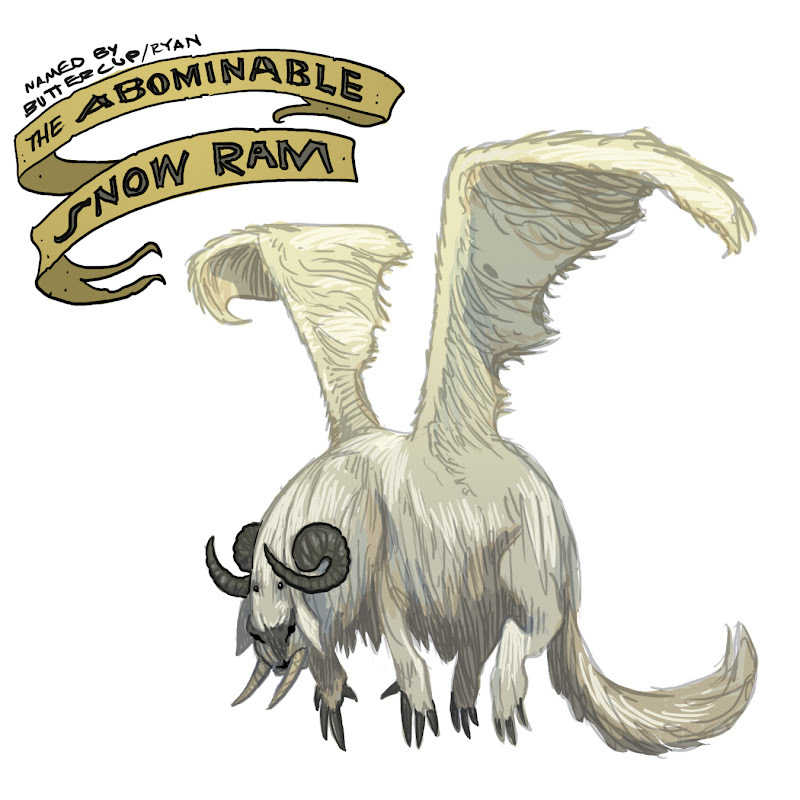 Stakkunalt guards a mystical treasure in the snowbound lands of his home, filling much of his time with tending flocks of yaks and working on his never-finished ice sculpture masterpiece.